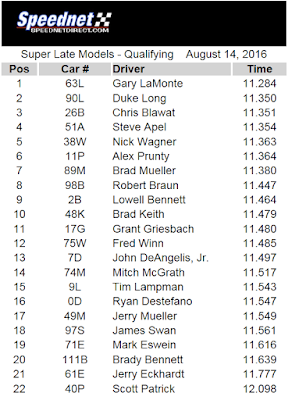 Slinger, Wis., Aug. 14—With a daring pass in traffic during the final ten laps, Gary LaMonte took the lead of the 60-lap super late model feature Sunday night at the Slinger Super Speedway and drove to his first career super late model main event victory. Brad Keith and Lowell Bennett led the field to the green flag and Keith led the opening lap before caution fell on the speedway quickly as Duke Long’s car skidded into the infield entering turn one. Keith charged back into the lead on the restart with Rob Braun settling into second place and within two laps Braun was on Keith’s bumper challenging for the lead. Braun took the lead with an inside pass on lap five as Steve Apel advanced to challenge Keith for second, taking the position a few laps later while behind them Gary LaMonte and Chris Blawat battled over the fourth position. 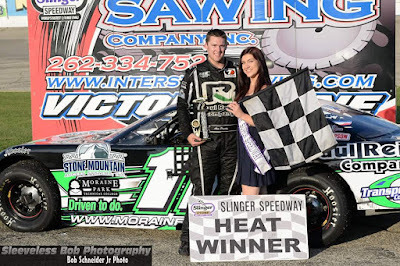 Fred Winn and Tim Lampman got together while racing hard for position on lap 8 and as the field stacked up behind them Brad y Bennett and Duke Long tangled, sending Long’s car sailing hard into the turn three wall and catch fence as the red flag was displayed. Long dropped the window net almost immediately indicating he was not seriously injured in the incident. 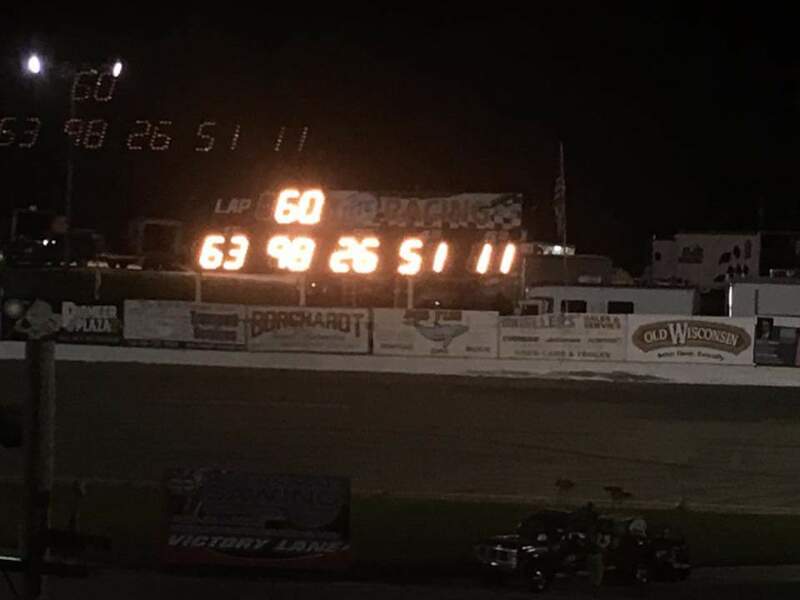 Braun and Apel paced the field on the restart and they raced door to door for several laps and swapped the lead before Braun eventually pulled ahead. Gary LaMonte and Chris Blawat advanced into third and fourth respectively as the front runners lined up around the inside lane. With Braun stretching his lead slightly, LaMonte was able to edge to the inside of Apel to take second just before the halfway mark as Blawat held down fourth just ahead of Alex Prunty and Lowell Bennett. The caution flag waved again on lap 26 for Brad Keith’s spun car in turn two with Braun leading over LaMonte, Apel, Blawat, and Prunty. Braun maintained the lead as racing resumed over LaMonte while Blawat went to work on Apel for third. Blawat eventually took the position a few laps later while LaMonte began to track down Braun for the lead. With the laps winding down, LaMonte closed in but a small scuff off the backstretch wall caused him to lose momentum, forcing him to start his charge forward all over again. The leaders approached lapped traffic and with nine laps to go, Braun’s car clipped the frontstretch wall and as he drifted into turn one, LaMonte dove for the opening and made the pass for the lead between Braun and a lapped car as they exited off turn two. LaMonte held on for the final laps to take the victory as Braun’s car trailed smoke from the right front on his way to a second place finish. Chris Blawat finished third with Steve Apel fourth and Alex Prunty in fifth. 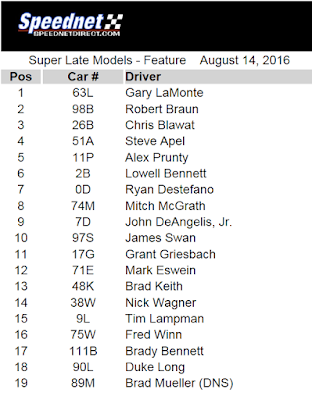 Lowell Bennett finished sixth followed by Ryan DeStefano and Mitch McGrath while John DeAngelis Jr. and James Swan rounded out the top ten. James Swan won the 30-lap super late model semi-feature over Ryan DeStefano and Mark Eswein. 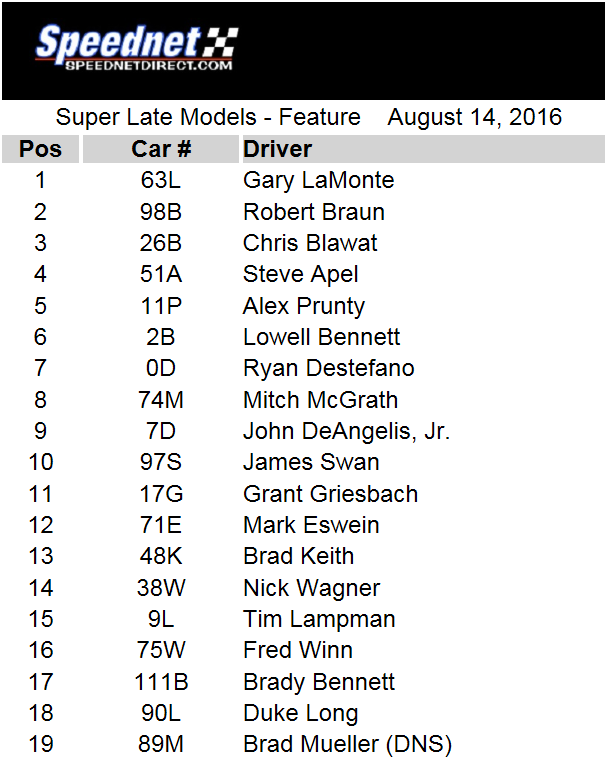 Brady Bennett and Jerry Eckhardt rounded out the top five. 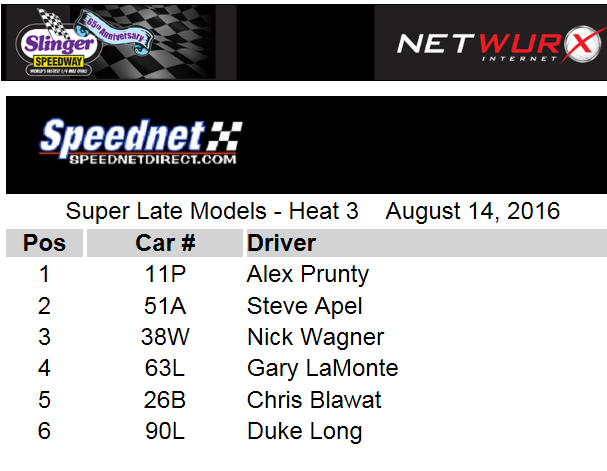 Super late model heat races were won by Mark Eswein, Mitch McGrath, and Alex Prunty. 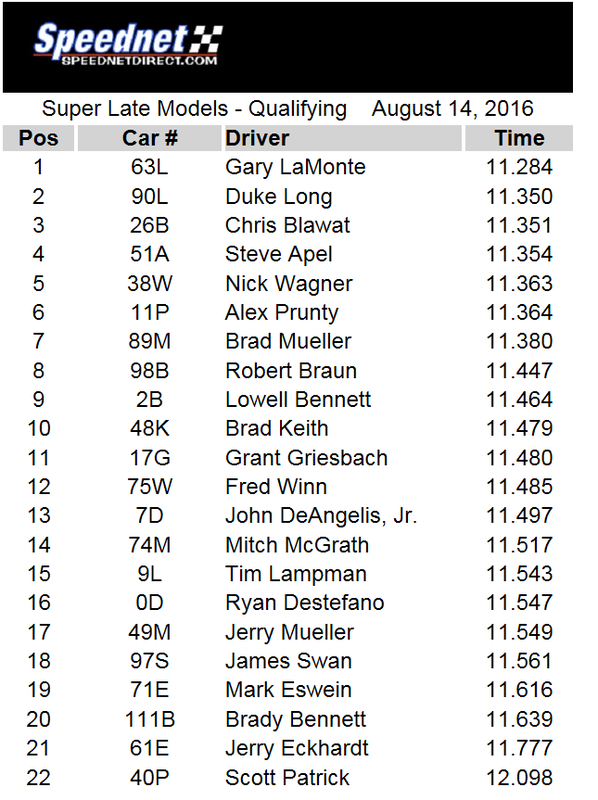 Gary LaMonte was the fastest qualifier with a lap of 11.284 seconds.